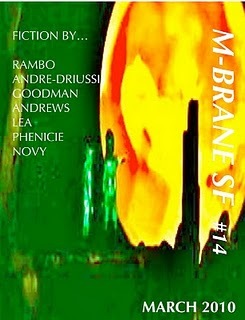 M-Brane is a great indie mag, now in their second year (not unlike my mag BCS). Among the many other authors in Issue #14 is my friend and colleague Cat Rambo. So definitely give this issue a look. This entry was posted on Wednesday, February 24th, 2010 at 10:24 pm and is filed under my fiction, SF/F, writing. You can follow any responses to this entry through the RSS 2.0 feed. Both comments and pings are currently closed.